Delivery from Sprout is now available! $20 minimum order / $5 delivery fee. Delivery hours are 11am-6:30pm. Call 717-392-7462 to order. *Gluten-free is available upon request. Deep-fried Vietnamese egg rolls with crabmeat, pork and vegetables. Served with nuoc mam sauce. Rice paper wrapped spring rolls with fresh SHRIMP and PORK, vermicelli, bean sprouts, basil, and lettuce. Served with hoisin peanut sauce. Rice paper wrapped spring rolls with deep-fried TOFU, vermicelli, bean sprouts, basil, and lettuce. Served with hoisin peanut sauce. Rice paper wrapped spring rolls with grilled seasoned CHICKEN, vermicelli, bean sprouts, basil, and lettuce. Served with hoisin peanut sauce. 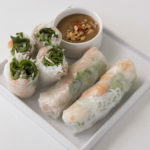 Rice paper wrapped spring rolls with grilled seasoned SHRIMP, vermicelli, bean sprouts, basil, and lettuce. Served with hoisin peanut sauce. Rice paper wrapped spring rolls with stir-fried BEEF and yellow onions, vermicelli, basil, lettuce, Chinese radish, and julienne carrots. Served with nuoc mam sauce. Rice paper wrapped spring rolls with grilled homemade PORK SAUSAGE, vermicelli, bean sprouts, basil, and lettuce. Served with hoisin peanut sauce. Rice paper wrapped spring rolls with cold shredded PORK SKIN, basil, and lettuce. Rice paper wrapped spring rolls with grilled seasoned PORK, vermicelli, bean sprouts, basil, and lettuce. Served with hoisin peanut sauce. This entrée consists of a bed of vermicelli rice noodles served at room temperature over shredded lettuce, cucumbers, bean sprouts, and cilantro. It is topped with peanuts, green onions, and fried shallots with a side nuoc mam dressing. Homemade ROLLED HAM and chicken liver PÂTÉ with our house mayonnaise, onions, cucumbers, jalapeño peppers, Chinese radish, and julienne carrots. Homemade ROLLED HAM with our house mayonnaise, onions, cucumbers, jalapeño peppers, Chinese radish, and julienne carrots. Chef’s special chicken liver PÂTÉ with our house mayonnaise, onions, cucumbers, jalapeño peppers, Chinese radish, and julienne carrots. Stir-fried SHREDDED CHICKEN and yellow onions with our house mayonnaise, lettuce, tomatoes, and jalapeño peppers. Grilled seasoned PORK with green onion garlic oil, crushed chili peppers, Chinese radish, julienne carrots, and nuoc mam sauce. Slices of deep-fried TOFU with green onion garlic oil, onions, cucumbers, jalapeño peppers, Chinese radish, and julienne carrots. Grilled seasoned CHICKEN BREAST with our house mayonnaise, onions, cucumbers, jalapeño peppers, Chinese radish, and julienne carrots. Grilled seasoned SHRIMP with our house mayonnaise, onions, cucumbers, jalapeño peppers, Chinese radish, and julienne carrots. Cold shredded PORK SKIN with green onion garlic oil, crushed chili peppers, Chinese radish, julienne carrots, and nuoc mam sauce. Cold shredded PORK SKIN and grilled homemade PORK SAUSAGE with green onion garlic oil, crushed chili peppers, Chinese radish, julienne carrots, and nuoc mam sauce. Fried Vietnamese PORK BOLOGNA with our house mayonnaise, onions, cucumbers, jalapeño peppers, Chinese radish, and julienne carrots. Combination of homemade ROLLED HAM, chicken liver PÂTÉ, and fried Vietnamese PORK BOLOGNA, house mayonnaise, onions, cucumbers, jalapeño peppers, Chinese radish, and julienne carrots. Stir-fried marinated BEEF and yellow onions with our house mayonnaise, lettuce, tomatoes, and jalapeño peppers. Soups are served with a side of bean sprouts, fresh herbs, limes, and jalapeño peppers. All soups are topped with onions and cilantro. An assortment of vegetables and deep-fried tofu in a steamy vegetable broth. This soup is topped with fried shallots. This hearty spicy beef stew consists of chunks of beef and carrots. This soup consists of Vietnamese beef-tendon meatballs in a light and tasty broth. 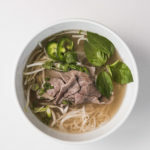 The Central Vietnam soup is a spicy pork and beef soup served in a fish stock with large rice noodles and topped with Vietnamese cilantro. This soup has a bold but delightful taste to satisfy your appetite. Pork hock upon request. This soup consists of a clear thin bean thread noodle with a combination of chicken, bamboo shoots, and fried shallots. The wonton soup consist of homemade pork and shrimp dumplings, Vietnamese barbecue pork slices, lettuce, and fried shallots. This soup is a combination of shrimp, squid, fish cake, imitation crab stick, lettuce, and fried shallots. This soup can also be prepared with shrimp only. Light, simple yet delicious tapioca noodle soup and topped with fried shallots. A half deep-fried marinated Cornish game hen with rice, a small lettuce and tomato vinaigrette salad, and a side of house honey mustard sauce. House fried rice with bean sprouts, eggs, green onions, and cilantro. Stir-fried beef cubes and yellow onions with rice, a small lettuce and tomato vinaigrette salad, and a side of house honey mustard sauce. Grilled seasoned pork chop or sliced pork over crushed rice and topped with green onions. This plate is served with cucumbers, tomatoes, and a side of nuoc mam sauce. Stir-fried marinated sliced beef and yellow onions with rice, a small lettuce and tomato vinaigrette salad, and a side of house honey mustard sauce. A steamed sweet sticky rice plate topped with stir-fried shredded chicken and yellow onions, Chinese pork sausage, green onions, and fried shallots. Served with a side of special soy sauce. Deep-fried tofu stir-fried with lemongrass, turmeric, and yellow onions. This dish is served with rice, a small lettuce and tomato vinaigrette salad, and a side of peanut sauce. A sweet meringue-based confectionery made with egg whites, sugar, and almond flour. 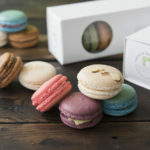 Our homemade French macarons are filled with assorted butter creams, chocolate ganache, or special edition fillings. Main parking lot is located in the back of the building. Kitchen closes 15 minutes prior to dining room hours. On street parking and parking garages are available near the restaurant.